A person's mouth ranks just slightly above feet and nasal cavity on the "grossest locations of the body" scale. It's a good thing that there is some sort of animal magnetism between people, or the french kiss wouldn't even exist. Think about it--it's basically just a living garbage disposal. Take any average American mouth, and there are countless germs, remnants of Quizno's from lunch, cuts on the roof of the mouth from eating Cap'n Crunch for breakfast(I wouldn't be surprised if someone has died from blood loss while eating this cereal), slivers of Dentyne gum between the teeth, and even perhaps a cold sore. Is this orifice really something we want to share in our intimate moments? For these reasons above, I have become an OCD oral care-taker. My daily mouth cleaning process includes brushing 3x a day, flossing till I bleed, water-pic at pressures meant for industrial cleaning, and the occasional mouthwash with gasoline-like Listerine. I don't do this to fight off cavities, but for the fact that the fact that the germ-fiesta in my mouth makes me self-loathe. According to my dentist, I am a little rough on my teeth. I always thought that brushing until my forearms were sore was the best approach, but I've since found out that I need to tone it down. My dentist stated that I've worn down the enamel, and have sensitive teeth. This was proved as he stabbed the tooth with a sharp pointy thing. My dentist runs a little on the Jekyll and Hyde side of things. Every time I show up, my dentist is one of the friendliest guys you'll ever meet. He usually asks about the family, vacations, etc. And then a mental switch must go off in his brain when he presses the button to recline my seat. Pain is then inflicted on a level incomprehensible to most serial killers or even Jack Bauer. He continually reaches into his stockade of pain-inducing pokers, stabbers, and drills while I make permanent hand impressions on the arms of chair from squeezing so hard. In addition, you most likely will be watching All My Children on an over-head TV at the time. After he is finished, he presses the button to incline my seat, and the switch in his brain flips the other way. He thanks me for coming with a smile on his face. I wonder if he understands what just happened? I walk out with numbness stretching into my nose, my Jabba-the-Hut-esque tongue hanging limply on my lips. Maybe I'm the one with the problem as I always set up an appointment for 6 months later. My dentist suggested I get a toothpaste for sensitive teeth. This would help relieve any pain. He also suggested an electric toothbrush and to use less pressure when brushing. I acquiesced to the demands of my torturer, and for many years have used Crest sensitivity toothpaste with good results. On a recent visit to the grocery store, my regular Crest toothpaste had changed. It looked like it was in a new box, but I didn't pay it much attention. I threw it in the cart and didn't think about it until I tried it later. That evening I surveyed the toothpaste and realized it was different. 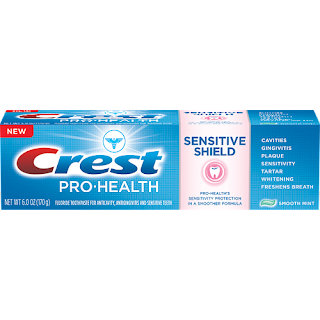 It is now called Crest Pro-Health Sensitive Shield. What a mouthful. 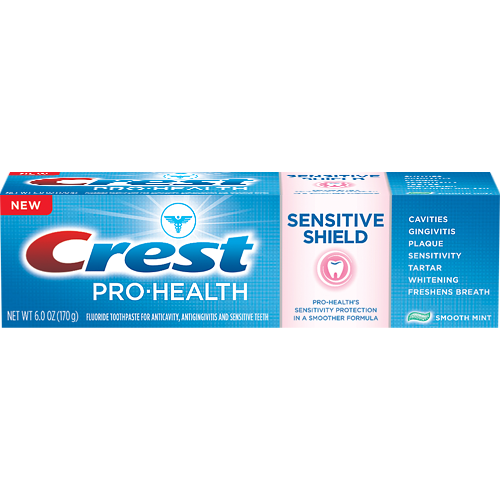 (haha) If they would have called it Crest Health-Pro Sensitive Shield, they could have just listed CHiPSS on the box. The next logical step would be to get Eric Estrada to do promos. I'm a marketing genius. This toothpaste is different than its predecessor. It is mushy like the glue paste I ate in 1st grade. It doesn't foam properly in my mouth (I like to look like a rabid dog while brushing), and the minty zest is just not zesty enough. I assume the sensitivity protection is good, as I don't have pain there, but I want to obliterate the germ-a-palooza that exists in my mouth when I brush. After brushing, I like to take a big breath in, and then smack my lips cuz the mint is so strong. One benefit is that this new toothpaste is in a larger container than the older sensitivity paste. Either that or the box looks bigger. I'm not in love with this toothpaste, and am not sure how long I will use it. Other sensitive toothpastes can be very expensive, so my budget may make the decision for me. I give Crest Pro-Health Sensitive Shield toothpaste 2 rinse and spit stars. Now i am using Crest Pro-Health Whitening toothpaste. It's working great. Thanks for sharing.